The end of James Robinson's run on this title can't come soon enough. Please, DC, grant me early salvation and simply publish anything until Peter Tomasi takes over. Literally anything. Reprints, for all I care. Just get Robinson off of this book. The work here is amateurish, sluggish, and terrible and boring on a scale I haven't seen before. This is simply one of the worst issues I've ever read. I remember, there's an issue in James Robinson's recent Wonder Woman run which is literally dedicated to Diana and Steve talking about all they'd done in those past few issues. It was monumentally terrible and a low point in Robinson's career; I can't believe the guy that wrote Starman and Hawkman wrote this. I get much of the same vibes in this issue of Detective Comics. 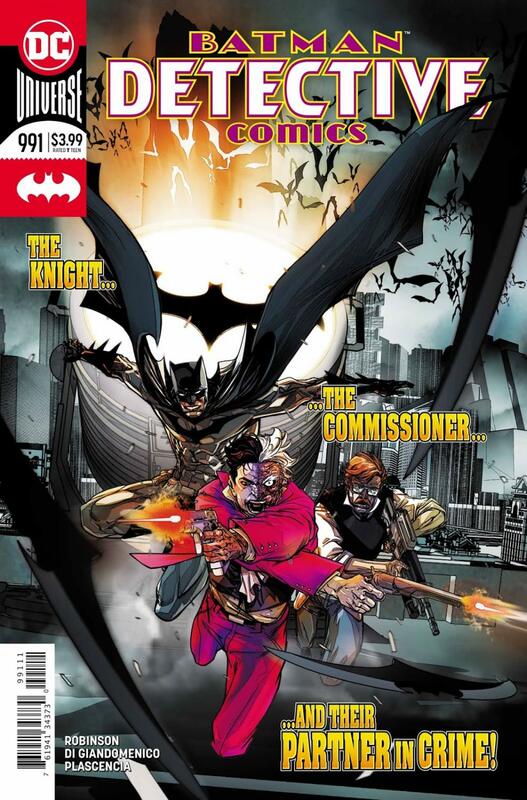 This issue is essentially a conversation between Batman, Two-Face, and Jim Gordon, a conversation that goes in circles and circles until Robinson decides to end the issue with a cliffhanger that I'm sure will get many people excited for what's to come. So, you hire Carmine Di Giandomenico, whose very style exudes energy and vibrancy, and you put him on an issue where a bunch of guys are talking? There isn't a single action scene in this issue, which is something Di Giandomenico excels at. The final page is the proof, it's vibrant and awesome and I hope he's drawing the rest of this arc. Still, this issue looks gorgeous. Di Giandomenico worked with colourist Ivan Plascencia together on the Flash, and these two works so well together. This is a gorgeous book, with lots of great details and environments.